Heli Aviation, a partner company with Diamond Helicopters, LLC is an FAA certified Flight Training provider and Utility Helicopter Company specializing in Aerial Photography and Film work, Aerial Trimming, Banner Towing, External Load Operations, Powerline Inspections, Fire Fighting, as well as aerial-spraying and Forestry Services throughout Florida, Georgia, Alabama, South and North Carolina, Tennessee, Mississippi, Louisiana, and South Western United States. Heli Aviation is truly a full service utility helicopter company that provides its clientele not only professionally maintained aircrafts, but ground support vehicles, specialized equipment (e.g. Heli Saw, Long line Equipment, etc.) and experienced, knowledgeable pilots, that demonstrate their dedication and skill each and every time they go up. Our precision flying, training and experience ensure that we deliver the very best flying service no matter what the job is. West Coast to East Coast, no job is too far away, or too small. 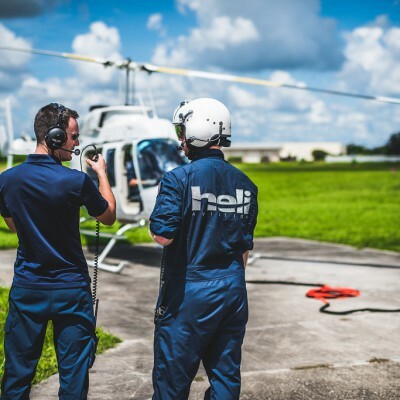 As a Helicopter Association International (HAI) member, we rely on the Target Zero Safety Management System, whose goal is nothing short of perfection, or zero accidents while providing helicopter services. I would recommend them over anybody in the Florida area. They were outstanding...!!!! Very friendly, absolutely professional, excellent pilots...I can´t remember the young guy who took me on the flight, He was excellent though and I am going to go back and get my actual license at this place due to it being the perfect all around atmosphere and people. I really enjoyed them I hope to learn to fly with the same guy who I flew with before. A +++ They were actually willing to let me come and use the flight simulator for free on down time!!!! Great amazing people! Probably one of the best flight schools out there. Highly recommended. Staff is super professional in and out. Always friendly and they use simple teaching techniques so everyone can follow and understand things easier. This speeds up the process and makes the 4-week private pilot training a success. I think Heli Aviation is actually the only company out there with such an accelerated course, which -again- makes them a great school. Highly recommended. Heli Aviation has been assisting Sarasota County in various projects with it´s full logistics capacity. Controlled aerial ignition and aerial trimming are just some of the services that Sarasota county has been utilizing. 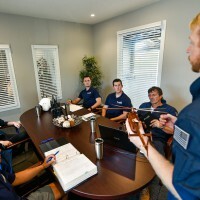 The Heli Aviation team has proven their expert knowledge, expertise, and complete reliability. 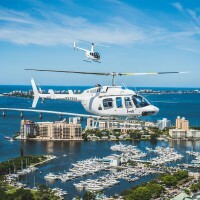 Heli Aviation is also contributing towards Sarasota county tourism development with sight-seeing offers that take visitors on beautiful aerial tours across Sarasota city and surrounding areas. We are happy to leave our positive opinion and highest recommendations! Once of the best flight schools out there. Super organized and clean facility. You could literally eat off the floor. Aircraft are in outstanding condition and if you find an oil spot, the owner will personally take care of it. Absolutely amazing to see such a young and super friendly team out there. Great company. Very friendly staff and knowledgeable pilots. I have just finished my CFI with Heli Aviation and will begin my CFII sometime next year. Their rates are very competitive and at least they tell you upfront what the "actual"costs are! Most companies I have talked to gave me higher hourly requirements which is simply a way to make more money. Ready the FAR and educate yourself, before you choose your flight school. Very happy with the decision and flying with Heli Aviation. Great flight school. You feel welcomed from the minute you walk in. I got my Private and Commercial close to FAA minimums and their pricing is very reasonable. The weather couldn´t be better during my training and we were able to fly pretty much 7 days a week. So I took two PPL lessons with heli aviation and I am very excited. 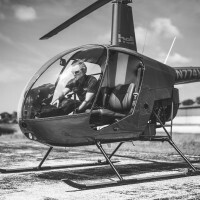 Helicopter flight school is costly, I have to spread out my budget carefully but I compared with other services and Heli aviation has the best deal. Iâ€™ve been flying with Jake and I must say he is well experienced and knows how to transfer his knowledge. With his help I was able to pick up the basics very quickly. Nick helped me with a beginners discount and this was a deal maker for me. 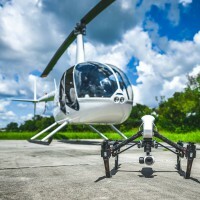 I contacted other companies and Heliâ€™s discount was unbeatable. The Robinson 22 you get to fly is a great helicopter to start with, very light, easy to operate and great fuel economy. You will be given control over the aircraft from day one. The one that Heli aviation flies seems well maintained and runs without a hiccup. So from my experience so far I recommend this company to everyone that wants to get a helicopter pilot license. Best, cleanest and most organized flight school I have seen so far! Heli Aviation is a top-notch operation and they definitely got their stuff together. From the general outfit to Instructors and aircraft Maintenance - it´s simply a great company. Couldn´t be happier and got my Pvt to CFII in just 6 months. Heli Aviation is an amazing crew that I always enjoy flying with. Niclas the owner has been my friend since day one and they have completely and extensively educated me over the past 13 months. I´ve received many great deals that I could´ve only dreamed about with other companies. It really speed up my helicopter licence and exceeded my expectations. The equipment is in excellent shape and meticulously maintained. Always on time, never even a minute late. Will continue flying and I extend my greatest recommendation! Great customer service and very friendly staff. Thanks again. The company does a lot of great things besides their daily business of beeing a flight service provider. For instance, the owner was personally involved in several Disaster Relief missions in Haiti and the Bahamas. That´s what makes a great company!